John Grant Tod, Jr.'s Grave. Image available on the Internet and included in accordance with Title 17 U.S.C. Section 107. TOD, JOHN GRANT, JR. (1864–1918). John Grant Tod, Jr., attorney, judge, and Texas secretary of state, son of Abigail Fisher (West) and John Grant Tod, Sr., was born in Richmond, Fort Bend County, on January 14, 1864. In 1866 his family moved to nearby Harrisburg, where he resided the rest of his life. He received an LL.B. degree from Yale in 1885 and practiced law in Houston. He served as county judge of Harris County, 1892–96, and district judge, 1896–1900. He was secretary of state during the second term of the administration of Governor Joseph Draper Sayers. He was also a member of the State Board of Education. He took an active part in the development of the Houston Ship Channel, including the extension of the channel through Irish Bend (later the Deer Park area) in 1905. In 1890 he was married to Osceola Morriss, and the couple had two daughters. 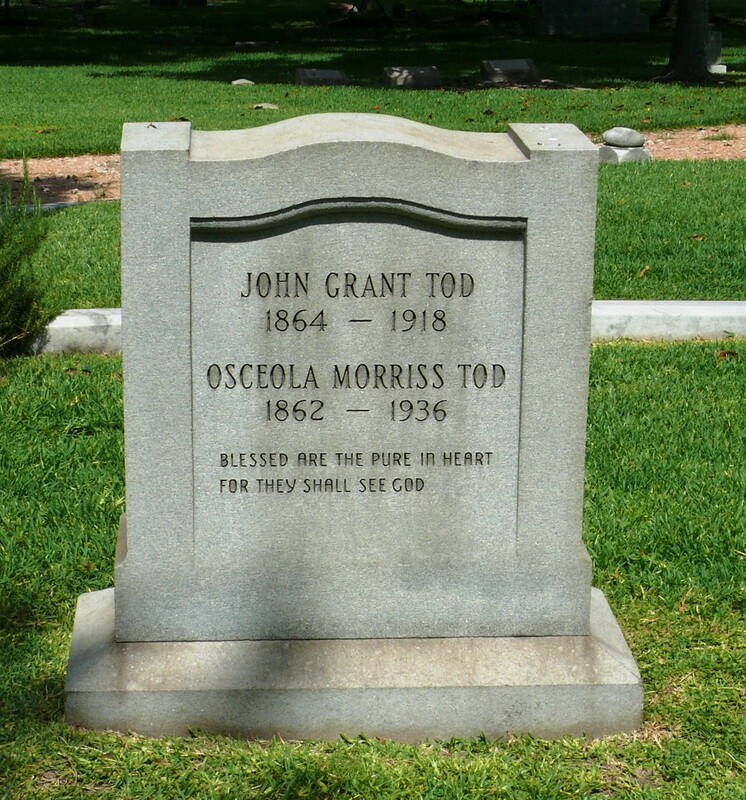 Tod died in Galveston on February 20, 1918, and was buried in Glendale Cemetery, Harrisburg. See also TODVILLE, TEXAS. John Leslie Dickson, The Houston Ship Channel (M.A. thesis, George Peabody College for Teachers, 1929). Niel John McArthur, The Twenty-Seventh Legislature and State Administration of Texas (Austin: Ben C. Jones, 1901). Proceedings of the Texas Bar Association, 1919. C. W. Raines, Year Book for Texas (2 vols., Austin: Gammel-Statesman, 1902, 1903). Marilyn M. Sibley, The Port of Houston (Austin: University of Texas Press, 1968). WPA Writers Program, Houston (Houston: Anson Jones, 1942). Handbook of Texas Online, Rosa Tod Hamner, "TOD, JOHN GRANT, JR.," accessed April 21, 2019, http://www.tshaonline.org/handbook/online/articles/fto06.